You know this because of the Botticelli Birth of Venus tattoo on his left forearm, with the word "Namaste" above it, one of 17 tats on his body but the only one on public display. There is a story behind that tattoo that, if you have any humanity inside you, will draw tears. 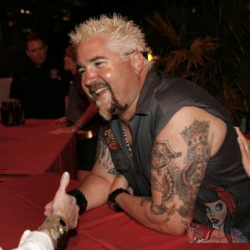 It is a story that says a lot about who Guy Fieri really is. It is a surprise. "My sister had melanoma and battled it for a year, and we just lost her in February." He stops for a moment, collecting his thoughts as a tenderness softens his face. "I was 22 when I saw the first huge version of Botticelli's Venus. It was early in the morning, I was in this restaurant and I remember thinking, 'Oh my God, that's my sister...beautiful red hair, beautiful complexion, tall. And every time I saw that painting I would see my sister Morgan, that was always my sister." Fieri credits Morgan with being the family teacher. "She's the one who got me into organics, she's the one who got me into recycling, she's the one who got me and my parents to work on spiritual stuff. And 'Namaste' is what she would always say at the end of her voicemails. You know, the God in me sees the God in you. And when you start to embrace that, it's so beautiful, it's one of the most amazing things ever." Guy stops. He seems entirely conscious of the paradox, so he addresses it, gesturing at the Venus, who is also his sister, inked on his arm. 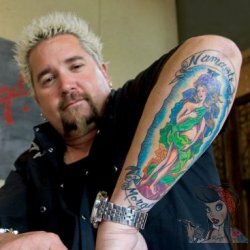 "People say, 'Oh, Guy's got a big tattoo, and the earrings, and so on. He must be a big rocker.' I'm not a rocker, I'm a little crazy, but this is the connection to my sister, and I had this done the day before we buried her. So I teach as many people as I can about namaste." Guy had the tattoo art transferred to a T-shirt. He distributed 150 of them to family and friends for Morgan's memorial service. "Everybody got to wear this (he raises the tattooed arm), everybody got to go away with a little piece." Morgan remains Guy's muse, his touchstone for keeping things real, the tattoo a roadmap to his heart. "I'm surprised I could even bring it up without crying," he says, "because usually I'm in deep tears at this point." Fieri has explained how addicting tattoos are and he wants many more. His tattoos include both of his sons initials, An eagle to remember cooking at the White House. 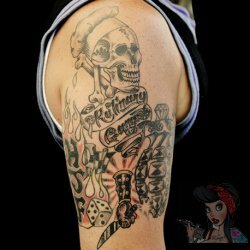 A skull that says Kulinary Gangster with a platinum grenade. A number 1 with an american flag inside of it and his last name under it. 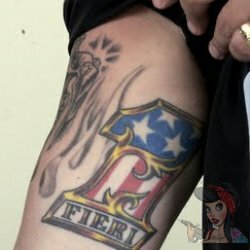 Fieri has many more but he hides them well and keeps the meanings close to his heart.